Plenty of humans -- past politicians included -- have turned to painting as a relaxing pastime. But what holds true for ex-presidents doesn't always hold true for animals. The Association of Zoos and Aquariums claims painting provides a "valuable form of enrichment for animals." But a small study in the journal PeerJ has found that a stressed zoo elephant doesn't appear to find calm in a canvas. Animal behavior experts at the University of New England in Armidale, Australia, found that the elephants who created art continued to show signs of stress. Between October 2007 and February 2008, the Australian researchers studied four captive Asian elephants at the Melbourne Zoo. The elephants, grasping brushes with their trunks, painted for an audience regularly, up to once a week. Before, during and after the painting sessions, the scientists took careful notes, looking for so-called stereotypic behaviors. These repetitive actions provide a way to gauge an animal's mental health. 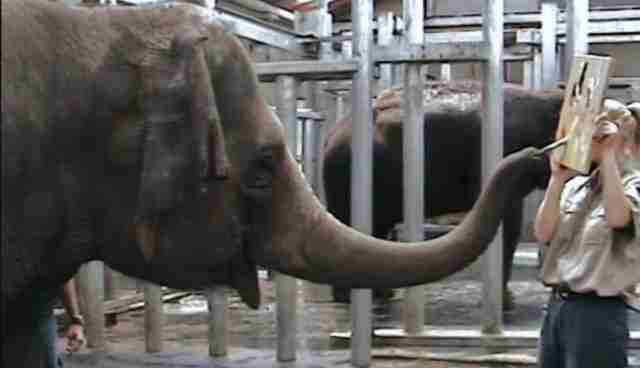 Elephants that pace around their enclosures, frequently bob heads or excessively swing trunks, for instance, are much more likely to be suffering the ill-effects of stress. Each elephant at Melbourne Zoo performs stereotypic behaviors, the researchers report. On the morning of the art sessions, keepers selected the elephant who appeared calmest to paint. Otherwise -- during the day, after painting and on days when elephants didn't paint -- the incidence of an elephant's abnormal behaviors occurred at the same frequency. Painting might keep a retired Bush happy, but it doesn't help the elephants at Melbourne Zoo. The goal of enrichment, the authors write, is to "reduce stress-related behaviour as well as encourage natural behaviour." At this, they say, painting falls flat. 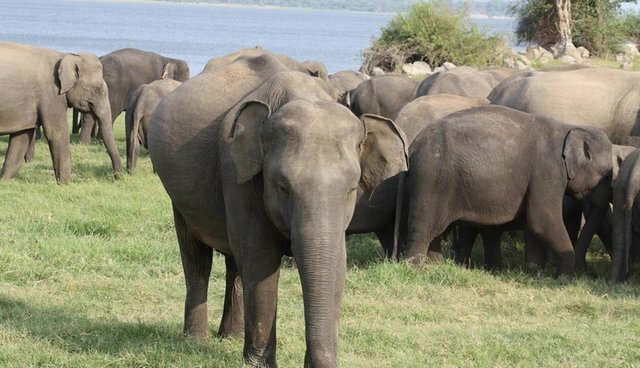 This study was only a sample of four, and elephants -- as cognitively complex creatures -- are certainly capable of having distinct personalities. (Perhaps there's an elephant, somewhere in the world, who might enjoy making brush strokes with her trunk.) But it's worth remembering that the need for enrichment underscores a larger problem: Captivity is an unnatural -- and often harmful -- environment for elephants. Instead of painting happy trees, it would be far healthier for elephants to walk freely among them. Based on these observations, it seems humans are the ones most enriched by a painting pachyderm. Beyond the sale of the art, of which a percentage "might be donated toward conservation of the species," the Australian scientists write, "the benefits of this activity appear to be limited to the aesthetic appeal of these paintings to the people viewing them."